For those extra tough cleaning jobs and hard-to-tackle problems, Aqua Mix offers a range of problem solver products. These products are designed to take on specific problems including removing efflorescence, set in stains and grime, sealers and coatings, grout haze, and other difficult problems. Efflorescence s a common problem, often seasonal, for masonry, concrete, and other natural stone. It is a result of water traveling through the material’s pores, to the surface, and evaporating, leaving behind a white, crystalline salt deposit. Areas with high humidity will often experience efflorescence more often than drier climates as water tends to evaporate before reaching the surface in drier conditions. To combat this problem, Aqua Mix has products designed to safely remove and inhibit efflorescence. For deep, set in stains that can’t be removed with typical cleaners, Aqua Mix problem solver products include a poultice stain remover. Aqua Mix poultice is an absorptive clay that is designed to safely draw out stains from natural stone, porcelain, masonry, concrete, grout, and porous tile. The poultice is especially good for removing oil, grease, and organic stains. Aqua Mix problem solver products also include acidic cleaners for heavy duty cleaning including removing grout haze, rust stains, mortar, efflorescence, and mineral deposits. Aqua Mix acidic cleaning products are available as a liquid, high-viscosity liquid, and granular crystals that are to be dissolved in water. Aqua Mix Cement Grout Haze Remover (formally Phosphoric Acid Substitute) is an acidic treatment designed to remove cementitious grout haze. Aqua Mix Eff-Ex is recommended to remove efflorescence build-up and prevent efflorescence from forming. Aqua Mix Ex-Treme is a non-flammable, heavy-viscosity acidic cleaner designed to remove years of accumulated discoloration from air pollution or carbon build-up. Aqua Mix Grout Haze Clean-Up is a safe and effective concentrated cleaner that is added to the final bucket of grout cleanup water for removal of cementitious grout haze and latex additive film from tile during the grout cleanup process. 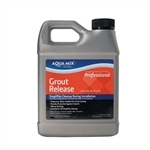 Aqua Mix Grout Release is a temporary, water soluble, pre-grout coating. Aqua Mix NanoScrub is an abrasive cream cleaner designed to work where other cleaners won't. Aqua Mix Poultice Stain Remover is a dual purpose, non-acidic problem solver. It is an absorptive clay that is designed to remove deep-set oil and grease stains without scrubbing. Aqua Mix Sealer & Coating Remover is a non-flammable, multi-purpose stripper formulated to stay wet longer which gives the product time to remove most sealers, epoxy grout haze, urethane coatings, synthetic finishes, adhesives, and paints. Aqua Mix Sulfamic Acid Crystals are granular sulfamic acid to be dissolved in water.